The metalwork is my sketch, a body to adorn in multiple layers of colored enamel. I choose materials that will change and react in unexpected ways as they are fired. High temperatures hasten chemical reactions: metals soften, molecular bonds break and new compounds form. The molten glass is like the changing surface of a miniature sun. When I remove the piece from the kiln the process freezes as the glass hardens. While hot, the enameled surface is a mystery; as it cools, colors and details emerge, much like a developing photograph. The finished work of art is a blend of intention and chance, intellect and emotion, fact and fiction. Kathleen Gatliffe is an enamelist living in Superior, Colorado. Her artistic talent and technical skill manifested early. She was a member of the first graduating class of the Virginia Magnet School of the Arts where she was noted for her large expressionistic oil pastels. Her interest in combining art with cutting edge technology led her away from the usual art school path and towards the engineering programs at the University of Colorado Denver, where she graduated with degrees in both mechanical and electrical engineering. 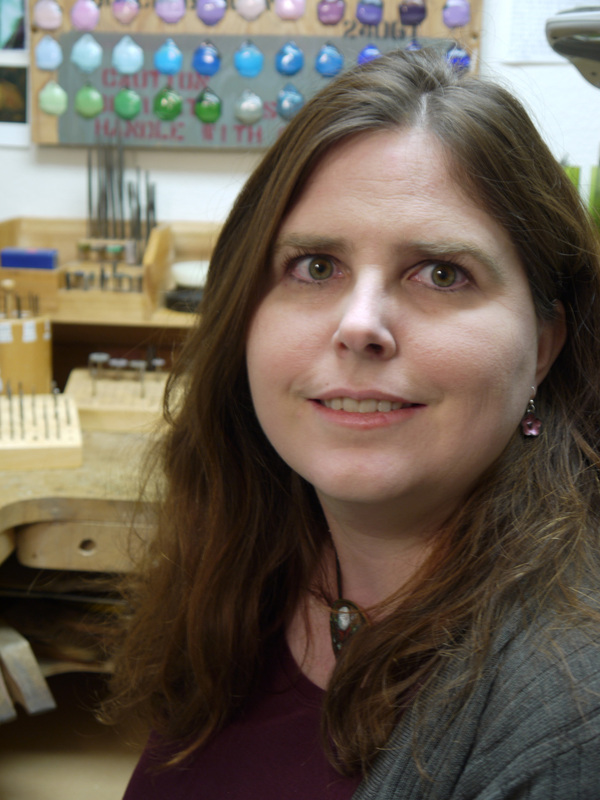 She began to experiment, first with lampworked glass and then with metal, in the hopes of marrying her love of science with her passion for art. Classes with noted Bay Area enamelists Judy Stone and Merry Lee Rae ignited what would become her true passion: enamel, the art of fusing glass to metal. Since then, Kathleen has dedicated herself full time to the mastery of this ancient art and the exploration of new techniques. Her studio is a place of experimentation, study, and wonder.